OBSERVER Photo by Lisa Monacelli Pictured above, Cassadaga Valley’s David Peterson brings the ball up the court during a basketball game on Monday at Cassadaga Valley High School. 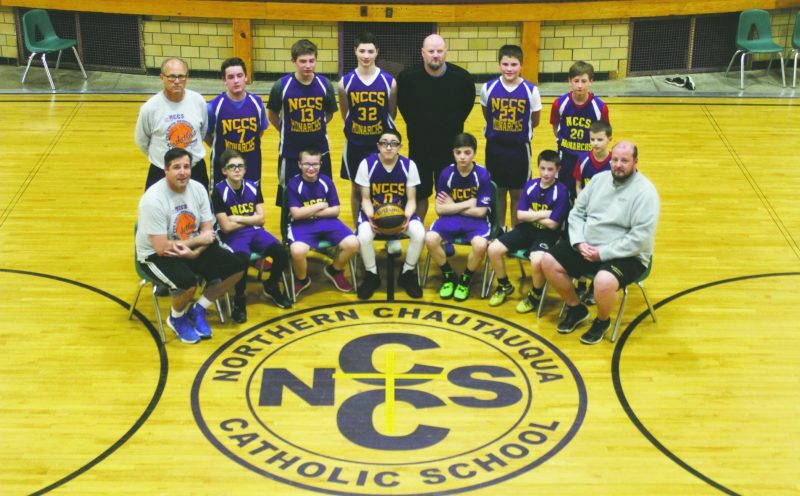 SINCLAIRVILLE — Conner Crabtree continued his quest to 1,000 points by scoring 19 points on Monday, but the Cassadaga Valley Cougars boys basketball team fell to Clymer, 70-43 in CCAA Div. 2 West league action. 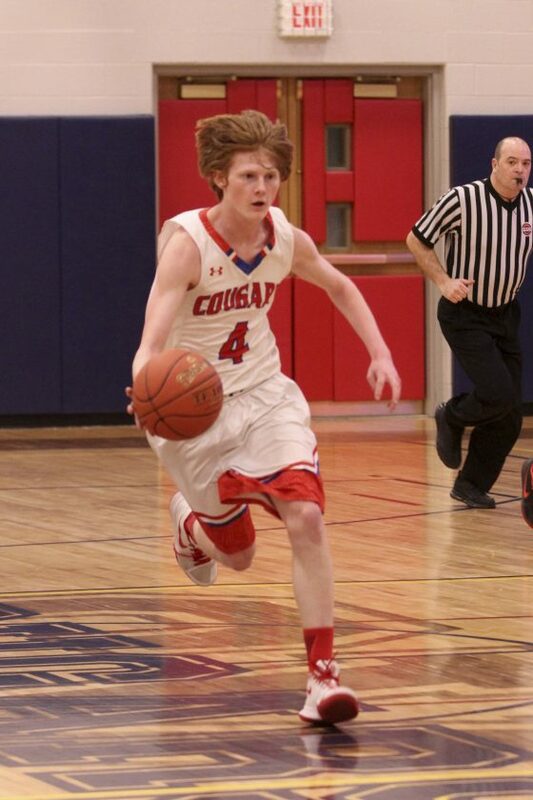 Ty Pattyson scored 13 points and added 10 rebounds for the Cougars in the loss. For Clymer, Lucas Beckerink scored 16 points and Zavon Overton added 12 points to help secure the win. Cassadaga Valley (7-11, 4-8) will be back in action on Thursday against Salamanca. PANAMA — Brocton led for most of the game, but Panama scored the final nine points of the game to beat the Bulldogs, 61-58, in Division 2 West play. Brocton led 58-52 with 1:40 remaining before Cameron Barmore hit a pair of free throws to make it a four-point game. The Panthers’ Jack Sperry then hit a 3-pointer to make it 58-57 before Barmore was fouled and made both free throws to give Panama the lead with 29 seconds left. Brocton then turned the ball over on its final possession and Mitch Hovey made two free throws to seal the win. Barmore finished with 31 points, 16 rebounds and three blocked shots while Sperry added 10 points for the Panthers (13-6, 9-3). Darien Booker led the Bulldogs (6-12, 2-10) with 18 points, including 14 in the first quarter, while Ronald “Bubba” Brown chipped in 12 points and 10 rebounds. Caleb Chelton chipped in nine points and five rebounds for Brocton. 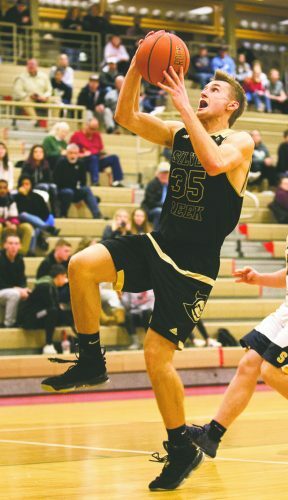 SOUTH DAYTON — Clayton Rowland came out and stuffed the stat sheet for Ellicottville by scoring 16 points, grabbing seven rebounds and dishing out five assists while leading his team to a CCAA Div. 2 East league win over Pine Valley on Monday, 55-48. Pine Valley came out of the gates slow, but battled all the way back to cut the lead to three points before Ellicottville pulled away at the end. Along with Rowland, Leif Jimerson scored 12 points for Ellicottville while Wyatt Chudy added 10 points of his own. For Pine Valley, Christian Ortiz led the way with 14 points and seven rebounds while Ryan Snyder added 12 points and Makiah Snyder pitched in 10 points. Pine Valley (5-12) is back in action tonight against North Collins. MAYVILLE — The Dunkirk boys basketball team jumped out to a 21-9 lead over Chautauqua Lake but weren’t able to hang on as the Thunderbirds came from behind to win, 70-60 in CCAA Div. 1 West league action on Monday night. Zach Fischer paced the way with 19 points while Luke Waters added 15 points and Kyler Majka pitched in 14 to lead the Thunderbirds to victory. Nate Adams was also solid, scoring 12 points and grabbing 13 rebounds. Leading the way for Dunkirk was Earl Stewart, who scored 26 points and according to Chautauqua Lake head coach Mike Putney, he was a handful. A’Marion Tell added 13 points for the Marauders in the loss. Chautauqua Lake (10-9) will play their final game of the regular season on Thursday against Maple Grove while Dunkirk (1-18) will play Allegany-Limestone on Wednesday.